What is a chat bot ? Chat bot, a computer program that simulates human conversation, or chat, through artificial intelligence. Chatbots, also called Conversational Agents or Dialog Systems, are a hot topic. Microsoft is making big bets on Chatbots, and so are companies like Facebook (M), Apple (Siri), Google, WeChat, and Slack. It is a service, powered by rules and artificial intelligence that you interact with via a chat interface. The service could be any number of things, ranging from functional to fun, and it could live in any major chat product (Facebook Messenger, Slack, Telegram, Text Messages, etc). Ask Narrator is a chat bot built by G-Square and implemented in our flagship product Narrator. Ask Narrator allows user to ask many questions related to your data in a simple English language and get the answers instantaneously. It is useful for business users who needs some specific information about business on a real-time basis. They can get insights by just asking English questions and without even looking at the actual data or reports which saves a lot of time for them. Ask Narrator can be accessed through PC, mobile or tablet hence users can ask the questions from anytime anywhere. Ask Narrator is built using various natural language processing techniques, artificial intelligence and machine learning algorithms. 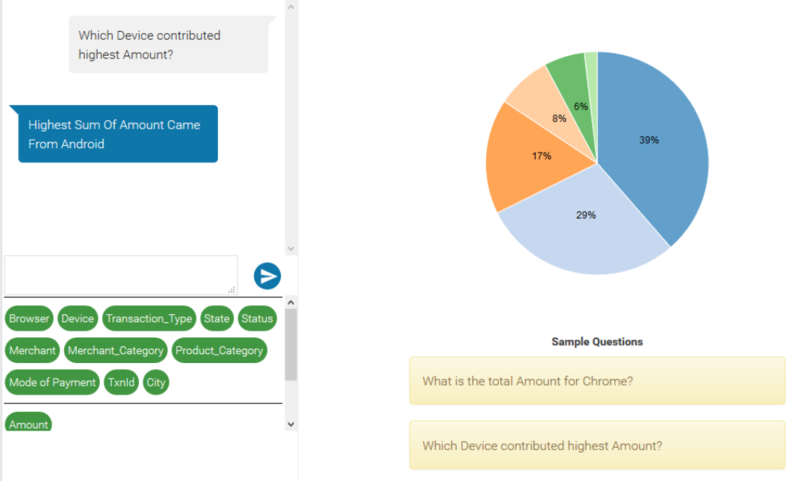 When a user asks a question in English language, ask narrator’s NLP engine identifies the context of the question and converts it into machine readable query language. Our AI engine then retrieves the information from respective data sets and displays the results back in English language using NLG (Natural language generation) algorithms. Ask Narrators learns from the type of questions being asked to it and suggests the similar question to users accordingly. This entire process is completed within a fraction of seconds. Thanks to our data processing technology. Ask Narrator retrieves the results on a real time basis i.e. it doesn’t store the prerecorded answers, hence the output will always be updated. Ask Narrator can be used by CEOs, CMOs, sales heads, marketing managers and other business users who would want to have business insights on click of a button. How is Ask Narrator different from regular chat bots? It is data specific: Ask narrator works only on the data which is uploaded and it calculates required answers from raw data. When a data is uploaded to narrator, ask narrator learns about the data automatically and does not require separate training to be able answer the questions.